It is critical for today's power system to remain in a state of equilibrium under normal conditions and severe disturbances. Power imbalance between the load and the generation can severely affect system stability. Therefore, it is necessary that these imbalance conditions be addressed in the minimum time possible. It is well known that power system frequency is directly proportional to the speed of rotation of synchronous machines and is also a function of the active power demand. As a consequence, when active power demand is greater than the generation, synchronous generators tends to slow down and the frequency decreases to even below threshold if not quickly addressed. One of the most common methods of restoring frequency is the use of under frequency load shedding (UFLS) techniques. In this chapter, load shedding techniques are presented in general but with special focus on UFLS. Fig.1 below shows the most common types of load shedding techniques and their sub-categories. Generally, load shedding techniques are divided into three main categories which are conventional, adaptive, and computational intelligence-based techniques. Computational intelligence includes techniques such as artificial neural networks (ANN), genetic algorithms (GA), fuzzy logic control (FLC), adaptive neuro-fuzzy inference system (ANF), and particle swarm optimization (PSO). They are robust and flexible in dealing with complex non-linear systems. Though further research is still in progress they have been implemented in different scenarios of load shedding in power systems. Their advantages can be summarized as below based on cases they were implemented. FLC can be used for load shedding application on a power system of any size. GA is a global optimization technique for solving non-linear, multi-objective problems. GA ensures a minimum amount of load shedding. PSO computation is simple and has the ability to find the optimum value. ANN can provide satisfactory results for known cases only and may fail to predict accurate results for unknown or varying cases. The membership parameters of FLC require prior system knowledge. Otherwise, it may fail to provide optimum load shedding. ANN can only work with Sugeno-type systems. GAs take a long time to determine the load shedding amount. This relative slowness limits their usage for online application. Conventional load shedding techniques fall in two categories which are traditional-UFLS and under voltage load shedding UVLS. Fig.2 shows the generalized process of traditional-UFLS and UVLS. Traditional UFLS is considered the most common and the basis of all other UFLS techniques. In this method relays makes use of locally measured frequency which is constantly compared against a certain threshold as the input. The frequency thresholds may differ from each power system and a violation of each threshold triggers relay action. They are simple and easy to implement. A steep frequency gradient (df/dt) and a gradual df/dt are usually treated equally and may result in over or under-shedding. Inability to provide optimum load shedding. They simply follow a preset rule in which a fixed amount of load is shed when frequency deviates from the nominal value. The main disadvantage of this method is that it does not estimate the actual amount of the power imbalance which results in either over-shedding, which affects power quality, or under-shedding, which leads to tripping of electricity service (Tang et al, 2013 & Njenda et al, 2018). Voltage Quality: Is used to refer to all disturbances in the supply of electricity, excluding interruptions that are covered. 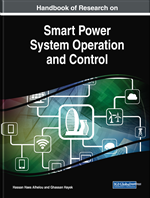 Power Oscillations: Power System Oscillations deals with the analysis and control of low frequency oscillations in the 0.2-3 Hz range, which are a characteristic of interconnected power systems. Under-Frequency Load Shedding: Under-frequency load shedding (UFLS) is a common technique to maintain power system stability by removing the overload in some part of the system. Power Systems: An electric power system is a network of electrical components deployed to supply, transfer, and use electric power. An example of an electric power system is the grid that provides power to an extended area. Electric Frequency: AC frequency is the number of cycles per second in an alternating current (ac) sine wave. Said another way, frequency is the rate at which current changes direction per second. It is measured in hertz (Hz), an international unit of measure where 1 hertz is equal to1 cycle per second.